Like the new quiet and sad eyed co-worker who turns out to be your greatest confidant…or the new seemingly polar opposite from you kid in school who turns out to be your best friend…or the new little mysterious human you bring home from the hospital who turns out to be the love of your life. First encounters are such a universal mystery. If you think back to when you first met all the special people in your life, and what your perceptions of them were at the time, I bet 9 times out of 10 you were way off and 10 times out of 10 you will laugh at your inaccuracy. When you bring that new born baby home and look into their eyes, (or at their closed eyes because unless you have x-ray vision you can’t look into their eyes until they are able to open them) a million thoughts stream through of what type of person you imagine they are going to be when they grow up. It’s exciting and daunting at the same time to admit you have a hand in, if not ultimate control of, moulding this person into one of the greatest ever made. As you ponder the super human your little one will transform in to, you can start them off on the right healthy track with some fresh homemade baby food purees. 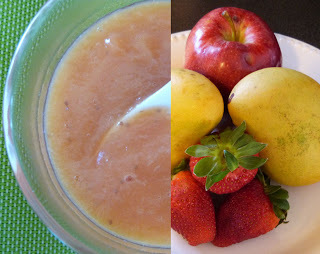 Today’s is a sweet fruit puree for those Solid Food Intermediates out there of 8 months+. This recipe includes apples, mangoes and strawberries. Although apples and mangoes are safe to offer baby at 6 months, you should hold off on strawberries until 8 months. Strawberries have a higher potential of causing an allergic reaction and babies are better equipped to handle such reactions at 8 months. Peel and chop apple into small chunks and set aside. Peel and chop mango into small chunks and set aside. If you’re not familiar with the anatomy of a mango, check my earlier post, “ Sunny Side of Grey” for tips on how to peel and chop them. Rinse and take green stems off of strawberries and chop into small chunks and set aside. Add all fruit and 3 tbsps. of water to a medium saucepan, cover and cook over medium heat, stirring often, until fruit is tender, approx. 12 minutes. Transfer to a food processor, blender or bowl to use a hand held blender to puree to a smooth consistency. Let cool for a few minutes then transfer to freezing trays in the freezer to be used within 3 months, and some to a food storage container in the fridge to use within 48 hours. No matter what you imagine your little one will be like when they grow up, you can be sure the constant love and care you offer them along the way will come back to you when they are old enough to realise how awful they were to you in their teenage years.